Your wedding day is one of the most important days of your life. You’re overwhelmed with emotion and love and the union between two people takes place in front of dozens of witnesses who have become part, in different ways, of the lives of the happy couple. This is why deciding where, when and how to get married are vital decisions. At Portals Hills Boutique Hotel we want to tell you about our wedding planning services in Mallorca. We will be telling you all about it in this article. Come with us! Planning a wedding in Mallorca, overlooking the sea and with Miami vibes sounds extremely tempting. The contemporary architecture of our Boutique Hotel in Puerto Portals, the essence of South Beach and our art deco style come together to create a setting that you will remember for the rest for your life. 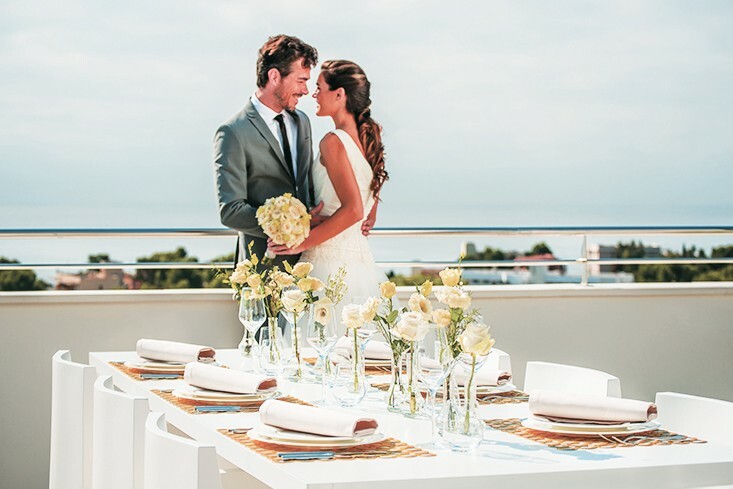 Our designer furniture, gourmet cuisine and impressive sea views only make your choice easier: that this is the ideal place to plan a wedding in Mallorca. If you had an intimate ceremony in mind for just a few guests, or on the other hand, you want something big and that makes a statement, our catering and events team will create a tailor made dream wedding. 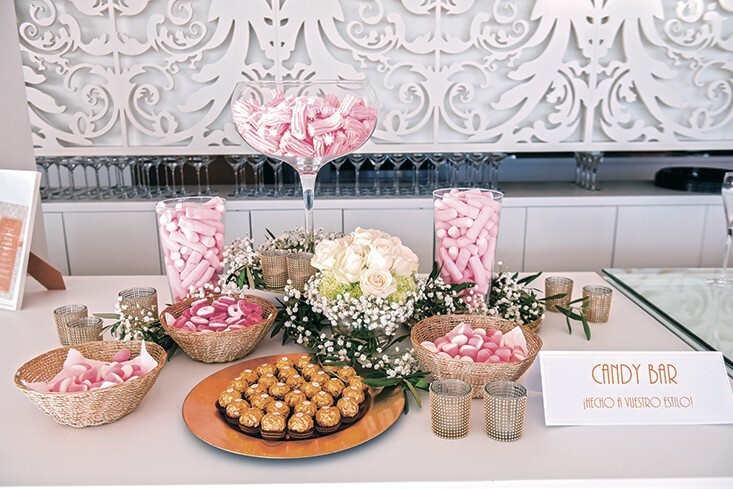 Our services include creating menus that will captivate our most exquisite clients, finding unique surroundings and adding energy to your wedding with the entertainment services which best suit your style. Our Boutique Hotel in Portals Nous allows you to disembark from your luxury yacht in the surroundings of the sporting port and start off your wedding day in the best way possible. Up to 60 guests who are part of your special day will welcome you with a celebratory cocktail on the terrace with sea views. In the Tropical Garden you can catch up with those you love most and tempt your appetite with one of our delicious preparations. It is, without a doubt, an occasion where there will be nothing short of the best gastronomy, which exudes from the kitchens of our hotel. To complement this event with a dream wedding sounds tempting. You can’t have a wedding without an after party. At our Boutique Hotel in Mallorca we’ve got it all: the reception can go on into the early hours of the morning in our private hotel club SUITE 32, the best way to end a wedding. Our Sunshine State environment will perfectly bring to a close such a special high class day. But before we think about cooling things off. In front of the infinity pool, you will find an ideal space to savour some delicious drinks and cocktails: The Cabana Poolbar & Lounge. A space with some impressive and luminous windows which let you look out towards some heart stopping views which will round off a day filled with happiness and love. Thanks to the glamour and location of the hotel, Portals Hills offers the best possible environment for any time of year to celebrate the most important day of your life. Whether it be intimate or extravagant, we can make your wedding a complete success. We can organise it all. What are you waiting for to start planning your wedding at Portals Hills? Contact us at events@portals-hills.com. Let’s create your own special story. Because such a special day deserves a special setting.